There is no easier way to get your kids to help in the kitchen than to pull out a bag of chocolate chips. Am I right? The highlights of childhood baking are as follows: eating chocolate chips straight from the bag and licking the beaters. These pumpkin chocolate chip bars have been on the blog before, but they are so incredibly good and so incredibly perfect for fall that they needed a repeat. The bars are cake-y, spicy, and studded with chocolate chips. They'll rock your bake sale, lunchbox, picnic...I promise. On low speed, add in the flour mixture in two additions, mixing just until combined. Spread the batter into the prepared pan, an offset spatula is great for this. Bake for 35 minutes, or until a toothpick inserted in the middle comes out with loose crumbs, but not wet. Cool completely on a wire rack. To cut, lift the foil from the pan. Use a bench scraper to cut into bars. Yep....they're good. And, with a cup of pumpkin in the mix, they're practically health food. Make them with your kids, or grandkids (or by yourself), you'll be happy you did! Yum! I'm glad you reposted them because I don't remember seeing them before and these are something that shouldn't be forgot. you've got the cutest kiddo ever!! Love how easy and delicious these bars are! I need to make a dessert for Allison to take to a homecoming dinner party this weekend, maybe I can send these!! I hope jon david enjoys baking with me when he is kiddo's age!! I made these last week and plan on making them again this week for some house guests we are having! They are delicious and addicting! One of my favorite fall treats! I just posted pumpkin chocolate chip cookies today! We are on the same wavelength! Your son is quite the fabulous chef! These look aaaaaaamazing! Making them today! These look amazing Bridget. 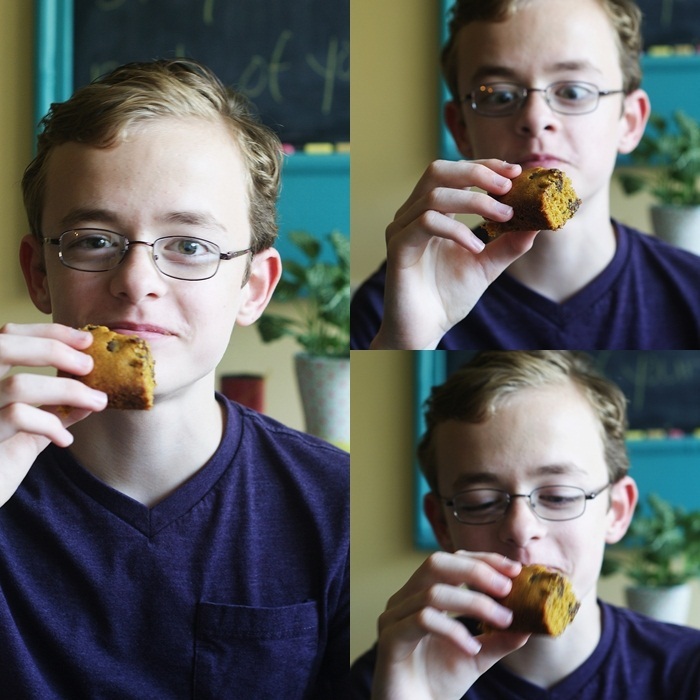 My kids love pumpkin cookies, so I bet they'd go crazy for bars. Yum! Your little man is so sweet! I don't remember seeing this recipe before, so thank you for featuring it again. I just made pumpkin muffins that are soooo good, so I'm going to make these very soon. As for Kiddo - well, he is just the cutest! seriously, I think he has his own fan club!!! I just received your book from Amazon-it is absolutely wonderful. I feel completely inspired to go BAKE-thank you for sharing your lovely ideas! Your son and cat are adorable, but those pumpkin chocochippers are killing me! Wow...I love to bake with pumpkin this time of year (of course, I think this is the ONLY time of year I used pumpkin! ), but usually I stick to the tried and true...pumpkin muffins, pies, bread, etc. But this looks scrumptious and is a "must make", something different is always welcomed in this house! Thanks for sharing! Cute pics of kiddo! I am making these this weekend! LOVE THEM! First time I had and fell in love with the pumpkin/chocolate combo was at Harry's market in Atlanta. Hi! I made these this afternoon with my 3 year old and they were beyond delicious! I had to stash half of the finished bars in the freezer so 1) I could have some for October and 2) so our family wouldn't be tempted to eat all these in two days! So yummy! Thanks! So glad to see Kiddo back in the kitchen! He's been missed. Certainly chose a great treat to make. I love pumpkin anything but have never made these. That is going to change and soon! I hope having a tuxedo cat is a leg up to making these taste good because I sure have a nosy one too! i love your little guy so much. i love your family so much. you are such an inspiration to me! what i'm trying to say... i love you so much. These are one of my go-to fall dishes! I saw them the first time you blogged about them, and although I don't like pumpkin I decided to give it a try. Needless to say, we love them! We are having a potluck Thanksgiving dinner with friends next weekend and these were requested! One of the best recipes EVER! Your Kiddo is getting BIG! I like a pumpkin sweet now and again thanks for posting! Yum! I'm glad you posted those again. I've never used whole nutmeg......but I think it's time. Handsome Kiddo! Oh man, I could destroy a whole tray of these...whoa...and I love your boy helping...awesome! I love that your son is doing all the work. Very cute! I have 2 tuxedo kitties and they are also curious. Repeats are perfectly fine when they are this delicious looking! Yum!!!! Adorable! That cat photo got a giggle or two out of me. Glad you put your son to work, these look delicious! We have all sorts of pumpkin goodies around the house lately. I bet that pumpkin makes these bars so moist! Love Mr. Spike watching Kiddo bake! Two COOL Dudes in the kitchen = my kind of baking! These bars are really yummy. They just came out of the oven and my kids are devouring them. The only change I made was to use a combination of dark, semi-sweet and white chocolate chips (because I only had a bunch of partial bags of chocolate leftover from a previous recipe I recently made.) I will definitely be making them again this fall! I can't turn down a good pumpkin recipe! These look delicious, perfectly moist too. Looks delicious! I would so love to try some. I am sure they taste great. These bars look so tasty! I love pumpkin with chocolate, and the spices sound just lovely. i just made them for dinner with friends and they were a hit! and i eve let my kids help and they still came out great! thanks so much for sharing this recipe. My Sunday School class thinks I'm even closer to Jesus since I brought these to share this morning. Recipe worked perfectly and the bars were delicious! Thanks! can i use fresh pumpkin instead of the canned one? A friend made these for a play date at my house and they were amazing! BUT, I'm doing weight watchers and wanted to try to lighten them up. Thought I would share that I used 1 stick of butter, and then 1/4 cup pear puree (baby food) and they came out really well! More cake-like and less dense/bar like but SO yummy and they were a hit for company! I made it last weekend, all my friends love it. So delicious. I've used 1 teaspoon pumpkin cake spice and 1 teaspoon cinnamon. Turns out great. Thank you for this wonderful recipe.